1.5 ft. 3 ft. 6 ft. 10 ft. 15 ft. The 15' Pearstone Swiveling HDMI to Mini HDMI Cable features a swiveling gold-plated HDMI type A male connector on one end and a fixed, gold-plated HDMI type C male connector on the other end. This cable provides an ideal way to connect a camera for playback on an external monitor or TV. The swiveling connector can be rotated 180-degrees either vertically or horizontally. This reduces strain on the cable and allows it to be attached in various orientations. It's ideal for running cables at different angles and installations in cramped spaces. This cable also allows you to benefit from advanced HDMI technology since it supports Full HD video, 3D and ultra-high 4K resolution. 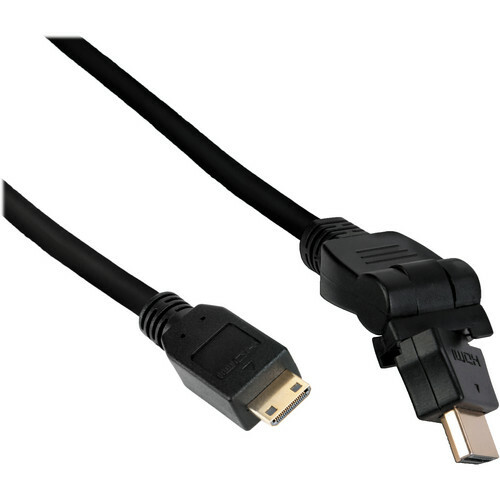 Box Dimensions (LxWxH) 7.3 x 5.6 x 0.8"
15' Swiveling HDMI to Mini HDMI Cable is rated 4.7 out of 5 by 3. Rated 4 out of 5 by Daryl A. from Good price for long video village runs I use this to run the output from my GH4 over to nearby video village setups with larger monitors or for a closer view of my DP6 while still remaining off camera and out of the shot. It is pretty heavy duty, which is ok for my usage. The swiveling is handy. Rated 5 out of 5 by Christopher S. from GETS THE DIRECTOR AWAY FROM THE CAMERA I use this 15' Swiveling HDMI to Mini HDMI Cable by Pearstone to give the director a way to view the shot while staying out of the way of the camera crew. It allows me to hand him a 7 monitor so he can watch each take we shoot. The cable works great! Rated 5 out of 5 by Ed from Works okay with my Pentax X-5 The cable I bought previously to connect my Pentax X-5 to an HDTV turned out to be an HDMI to HDMI mini cable. This would not fit the HDMI port on my camera. The HDMI mini to HDMI micro adapter solved the problem. I can now view what the camera is seeing on my 40-inch HDTV.